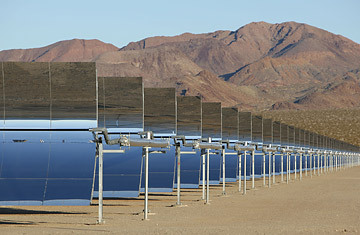 Acciona's Nevada Solar One concentrating solar power plant. Smack in the middle of the Mojave Desert, the Las Vegas area gets around 330 days of sunshine a year. February 22, however, was not one of them. NSI is solar power with a twist: it harnesses the heat of the sun, not just its light. Instead of directly converting sunlight into electricity with photovoltaic panels  the kind you might see on rooftops  solar thermal uses rows of specially curved parabolic mirrors to focus sunlight on a pipe full of synthetic oil. The sun's energy superheats the oil, which is then used to boil water into steam. The steam runs turbines, which generates electricity. The technology is as simple as any fossil fuel plant, and cheaper by material than the technologically complex photovoltaic panels. It can be more easily built up to utility-scale than photovoltaic solar  Acciona's plant, which began operation last year, produces 64 megawatts of electricity for the utility company Nevada Power, enough to light up 14,000 homes. The company's Spanish competitor Abengoa just announced a plan to build a 280-megawatt solar thermal plant outside Phoenix, which would be the largest such project in the world. All you need is a lot of sun, a lot of space and a lot of mirrors  and NS1 has all of the above. 182,000 parabolic mirrors are spread over 400 acres of flat desert, creating a glistening sea of glass visible from miles away. Up close they're shaped like shallow satellite dishes, chasing the sun's movement as it passes through the sky. On the cloudy day I visited, the plant was running at less than full capacity, and some of the mirrors were turned downwards to block the force of the wind, which had the glass vibrating. Although the plant might look like fragile, it's not; plant manager Robert Cable told me as we tour the facility that NS1 has only lost around 10 mirrors in 9 months of operation. "This is not a special project," he said as we drove through corridors of mirrors. "These things work. We're here to make money."